Fyodor Dostoevsky has been somewhat of an enigma to me for many years. Thankfully, Peter Leithart’s latest book that bears the name of this famous Russian author sheds light on his life and worldview. Dostoevsky was the son of a strict Russian physician. He graduated from the military academy and was, in the final analysis, exiled to Siberia – accused of “subversive activities” against the state. Once released, Dostoevsky continued his brilliant writing career – but not without personal struggle and hardship. Many of his novels bear this out – namely, his battle with gambling and interpersonal conflict. He also struggled physically. Epilepsy dogged him for many years. Despite his battle with sin, Dostoevsky clung to the cross of Christ. He was a real man with real pain. Perhaps this is what attracts so many people to his writings. Dostoevsky was an authentic man who was not afraid to share his struggles. 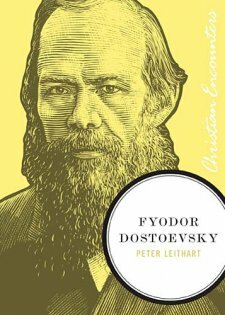 Peter Leithart should be applauded for his latest work on Dostoevsky. It is evident that he has read and devoured Dostoevsky’s novels. And his creative, first-person look at the writer is an inside look at this fascinating Russian man. I received this book free from the publisher through the BookSneeze.com <http://BookSneeze.com> book review bloggers program.